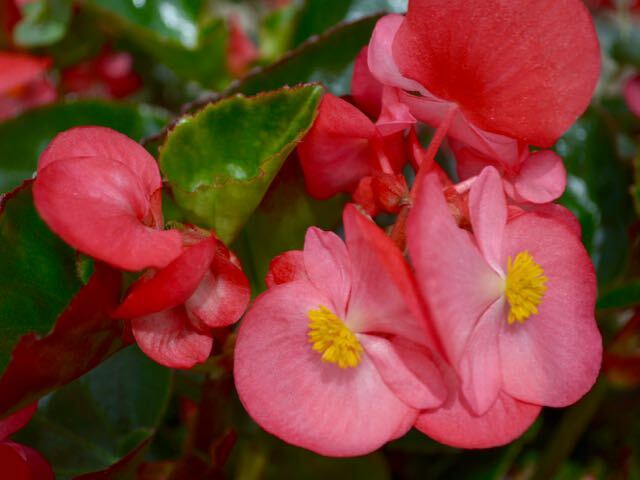 Have you ever eaten a begonia? I hadn’t even thought about eating one until a tour with the National Garden Bureau introduced me to a Pink Lady garnished with one, courtesy of plant breeder Benary. It was the flower of one of their BIG series (Begonia x benariensis) and its lemony flavour was a complement to the lemony cocktail. Looked pretty, too. 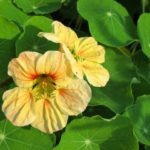 When you’re planning your edible garden this year, remember to consider growing some edible flowers, too. Some might already be known to you. Others, like the begonia, might be a complete surprise. Of course, if you’re growing anything you’re going to eat, do your research before you put it near anyone’s mouth. For example, this list from seed company Thompson & Morgan gives a long list of petally edibles, along with some warnings, too. Check for others, just to be sure. 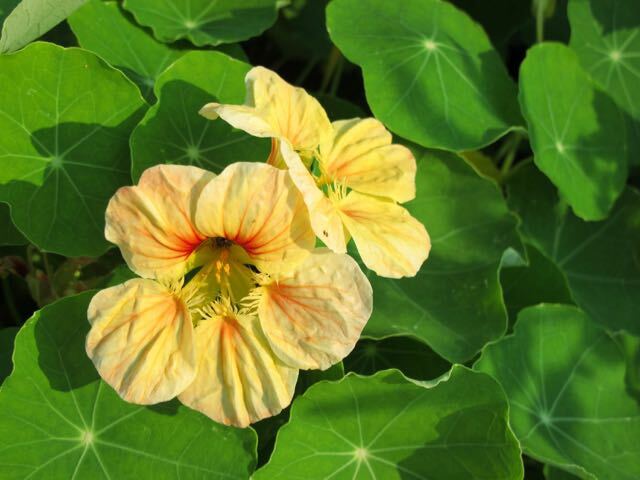 Be aware that some of the plants listed here – including our covergirl – do have caveats. [Ed: Make sure, too, the flowers haven’t been sprayed with pesticides!] With that in mind, read on. 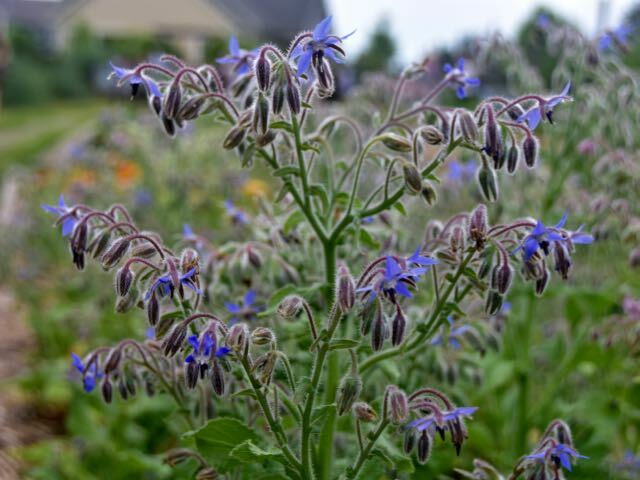 Beautiful blue borage (Borago officinalis) is an enthusiastic annual that bees also love. You can see why they also call it starflower. Few flowers are blessed with that vibrant shade of blue. Be sure to use some before they go to seed. They taste a bit like cucumber. Self-seeding can be a problem in the right (or wrong) setting. 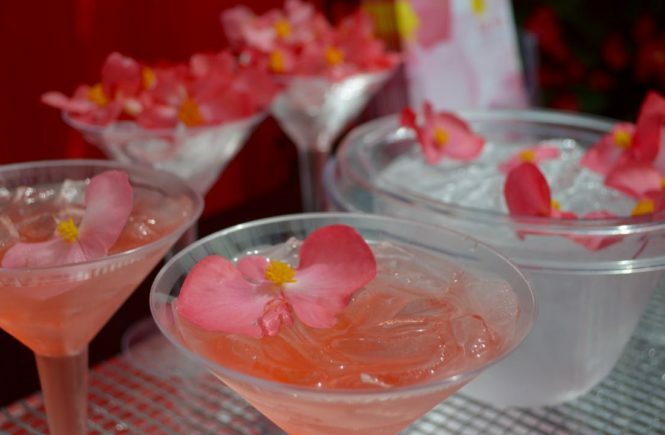 Freeze some flowers in ice cubes for your summer beverages. Remember what I said about caveats? 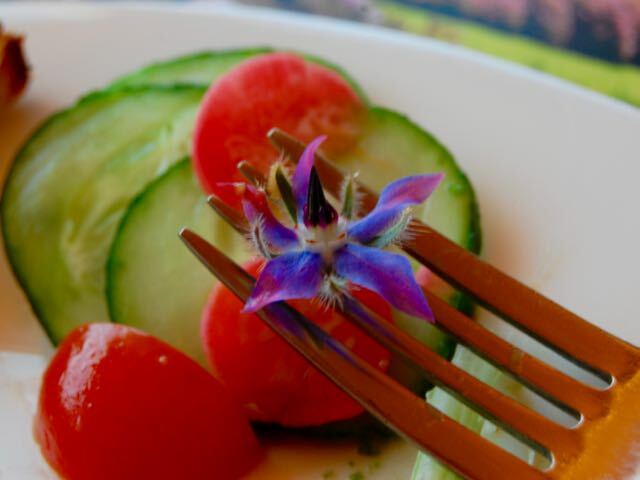 Borage flowers shouldn’t be eaten in quantity, or if you’re pregnant or lactating. 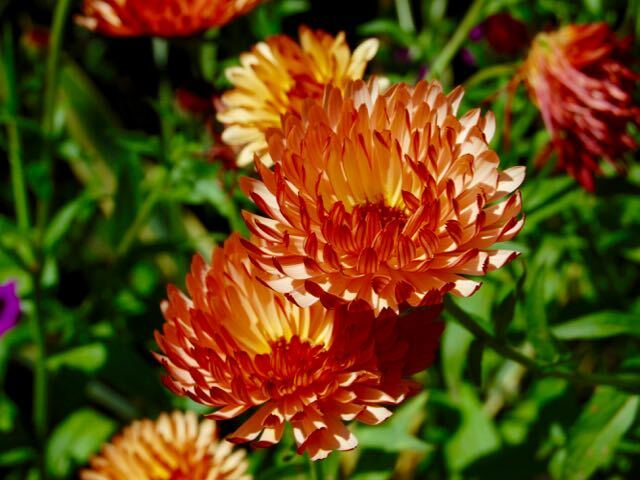 Look around for new varieties of old favourites, like the Calendula or pot marigold above. I love the cinnamon edges on the newer version such as the ‘Flashback’ series you can get from Renee’s Garden. Calendula petals can brighten up a sweet or savory dish, as you can see above. And you can use the dried petals to colour rice, a bit like saffron. Teatime at the Abkhazi Garden. 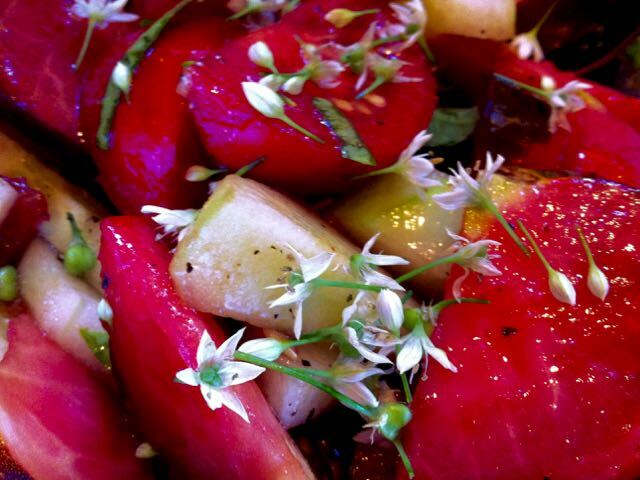 Fuchsia is another edible flower that surprised me. There it was, garnishing our shared dessert (Mr TG’s dessert is always half mine) on a visit to Victoria’s Abkhazi Garden. 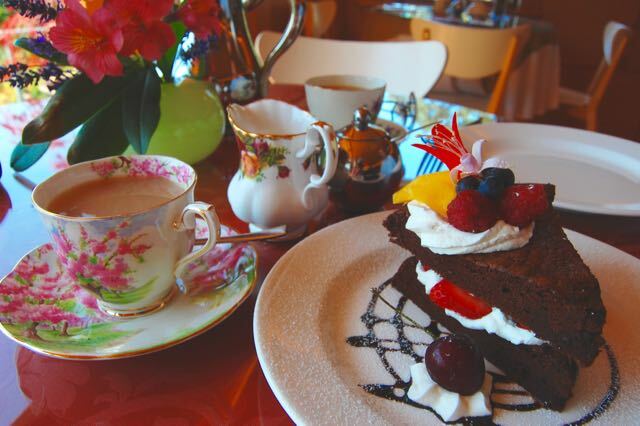 If you haven’t visited this national treasure, you should – for more than their charming tea service. 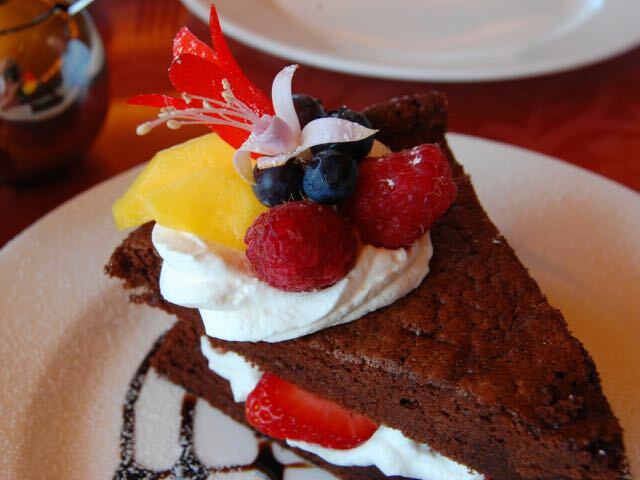 At the time, I didn’t know I could eat the flowery garnish, too! More fool, me. Soon, very soon, we can start to plant out pansy or Viola flowers, which means we’ll soon be able to gather one of our first outdoor garden harvests of the year. 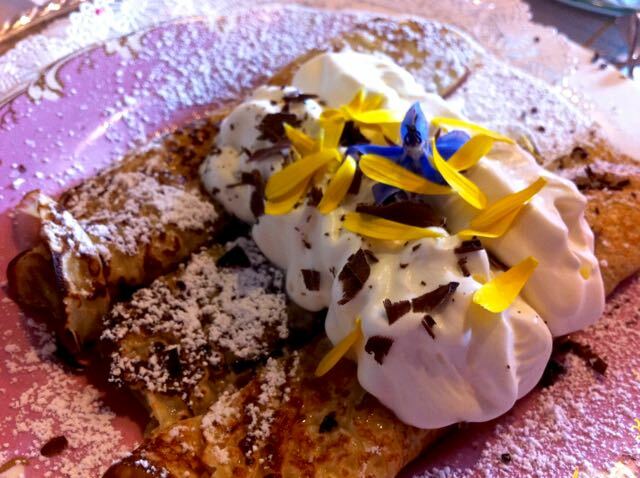 Yes, viola flowers are edible. 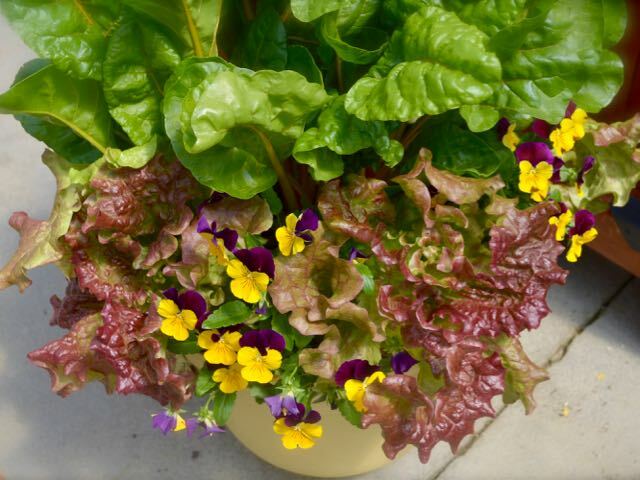 Imagine a salad made from the plant combo below, dotted with smiling flower faces. 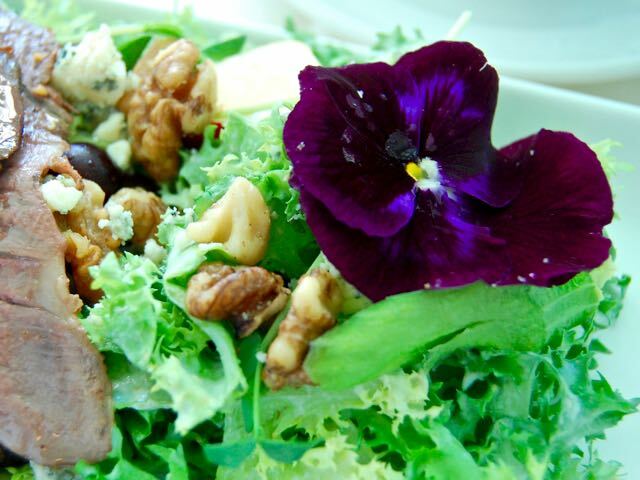 Or adding a large-flowered pansy to a salad, like a bow on a gift. Want to make candied violets for your sweet tooth? Here’s a how-to. 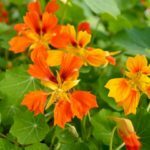 Nasturtiums (Tropaeolum majus) are one of the superstars of edible flowers. The flower, leaves, and seed pods; all are edible. 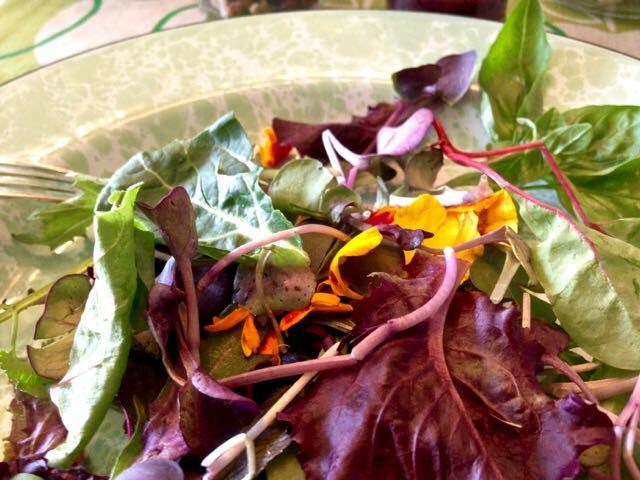 I love how the peppery taste adds kick and colour to a salad. Sometimes I eat one right out of the garden – inspecting it first for any extra, aphidy protein. What a range of shape and colour! Below, left to right, are ‘Phoenix’, a mixture of diverse colours, and ‘Peach Melba’. 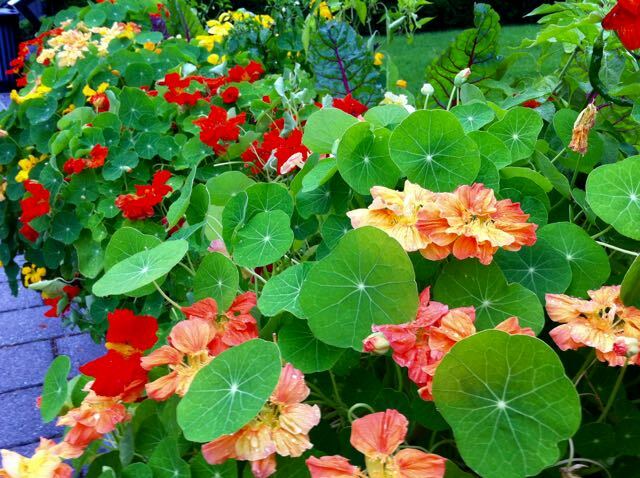 The flowers of classic vegetables and herbs can surprise you with their own taste. 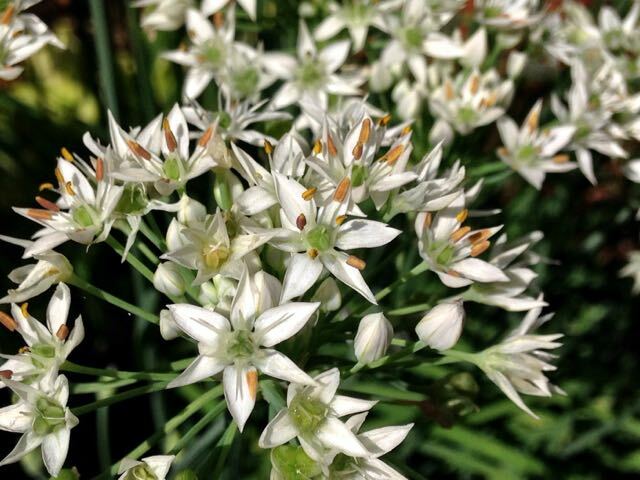 We usually think of eating the leaves when we use garlic chive (Allium tuberosum). 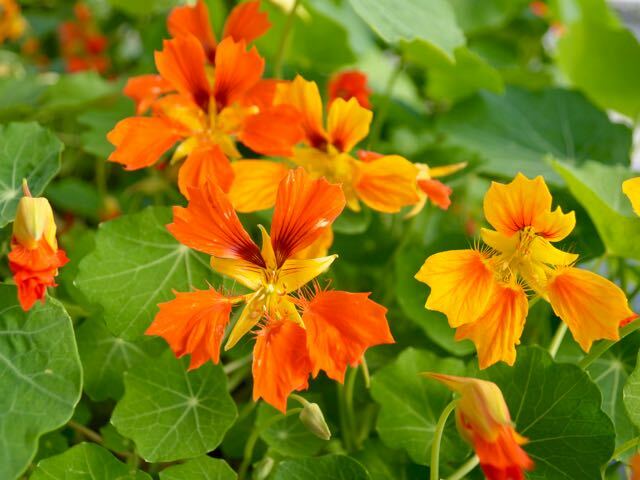 But the tasty flowers make a decorative topping for salads or cooked garden veggies. Find seeds of Little SnowPea Purple, bred by Sakata, through Canadian seed companies like Stokes and Veseys. 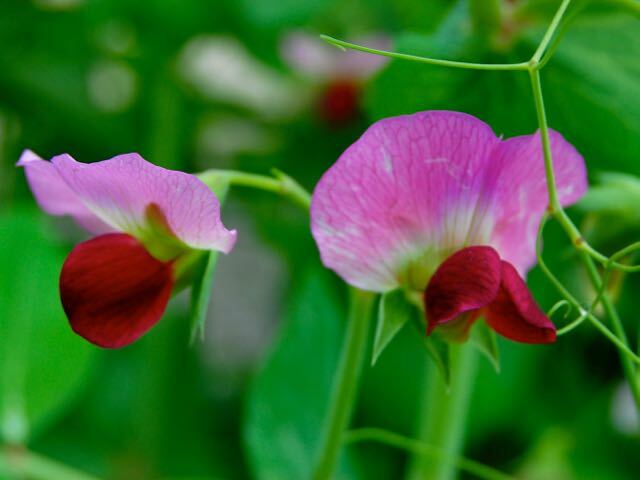 When you’re eating the garden peas, you might forget that some also have edible pods – like the snow peas above or snap peas. But you might not even realize that the tendrils, shoots and flowers can be eaten too. Of course, any flower you eat subtracts one pod of peas from your dinner plate, but you might we willing to sacrifice a few if they’re as colourful as the ones above. Note that ornamental sweet peas cannot be eaten. Always check, check and double-check, as I said before. Experts on foraging such as author Ellen Zachos and her website Backyard Forager can be a place to start. In Canada, the government has a long list of poisonous plants to know. You’d be amazed how common they are. Stuffed zucchini flowers aren’t unusual. 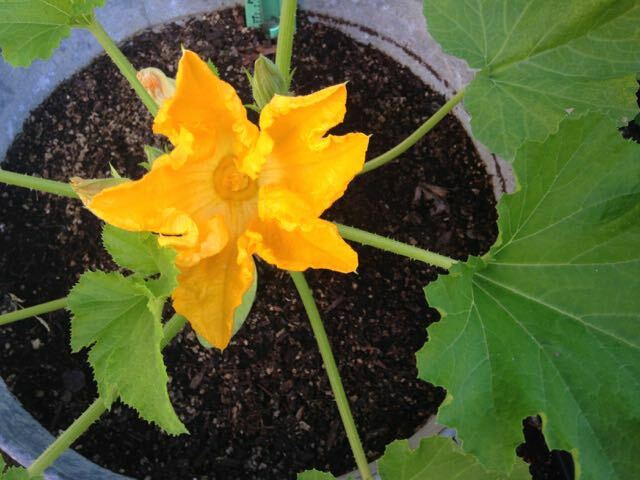 My plants tend to make way too many male flowers before the fruiting females begin to show, so when I grow zucchini I have a million of them. Come on over for dinner. 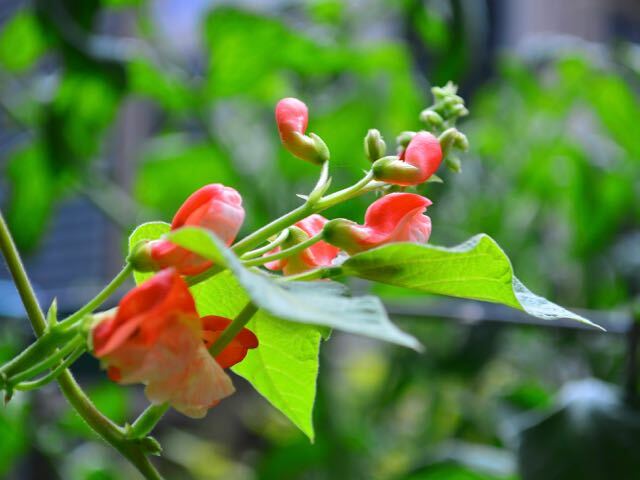 When I ordered bicoloured ‘Painted Lady’ scarlet runner beans a couple of years ago, I was interested to learn that these can be grown mostly for the flowers, which taste mildly beany. We still had plenty of runner bean pods to enjoy later in the season. 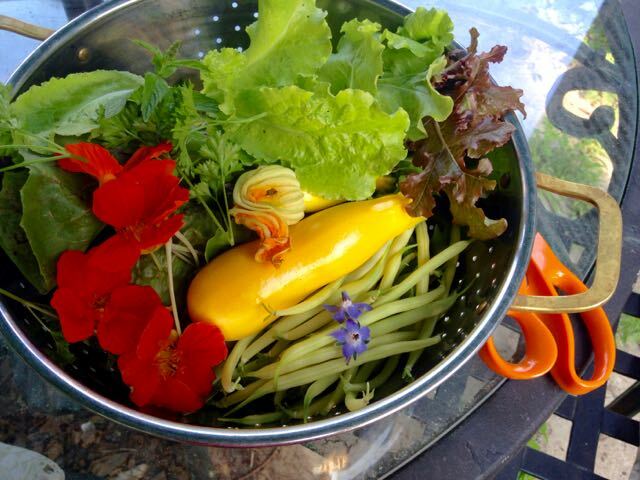 A summer harvest of herbs, flowers and garden vegetables. 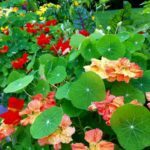 Flowers can do double-duty as ornamentals and edibles, which is great for small garden growers like me. So think beyond the veggie patch as you plan your 2018 garden. Just a few possibilities are suggested here, but as always we would love to hear from you. What are your favourites? Monarda, or Bee Balm, flowers are delicious and a bit peppery. 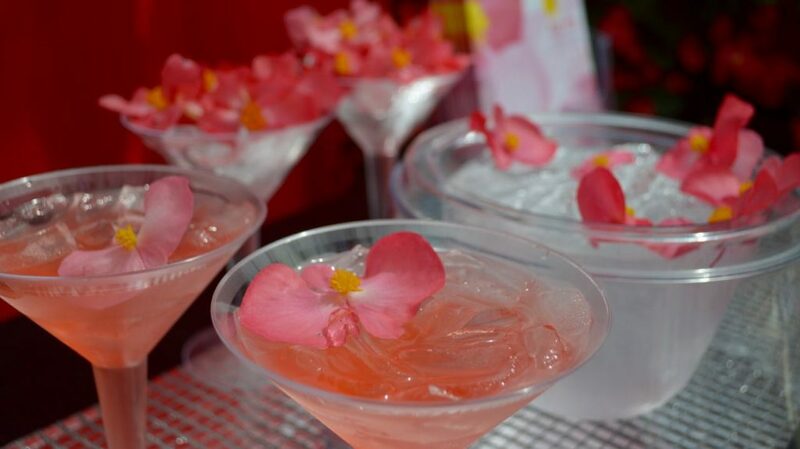 You can freeze them in ice cubes and serve them in fancy cocktails at your garden party. And tasty, too, Jessica! Going through my photos, I even found a line of violas or pansies called Tasty! Looks like we’re all catching on. A nice topic for a cold winter’s day. 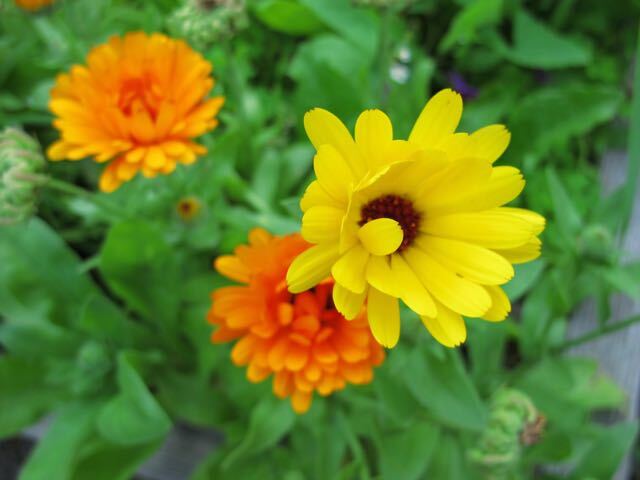 I love orange marigold petals zinging up a salad (a good reason to grow ’em). Winter! Slowly I turn… But the rain has (finally) washed away most of the snow, and I can even see the noses of snowdrops starting to poke up. Yay! You are quite welcome, Beth. I’m proud to have been in the first wave of #NGBplantnerds. In fact, coming up soon will be a post about the plant testing program for All-America Selections (which should perhaps be called All-AmericaAndCanada Selections). Nastursium seeds harvested young and green can be pickled to use like capers. Yum! I’ve known that for years but never actually tried that. Must look up a recipe!